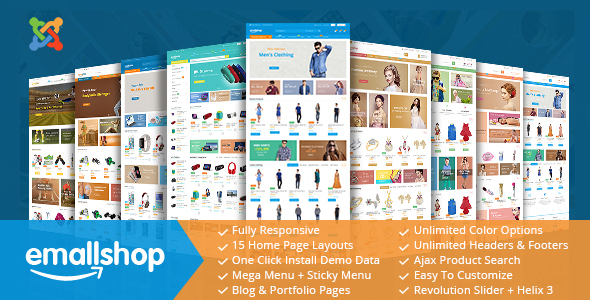 EmallShop is perfectly suitable for fashion and your online stores. 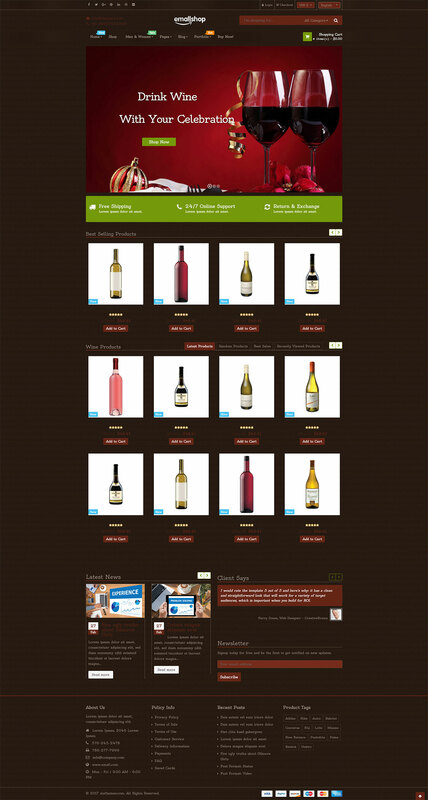 This is done with the help of one of the most popular Joomla eCommerce solution, VirtueMart 3.We have included multiple layouts for the home page, blog page to give you best selections in customization. Responsive Layout: this means that you only need one template for the desktop, tablet, smartphone and other mobile devices. Helix Framework: is one of the best light and feature rich responsive framework for Joomla Templating. Ajax Add to Cart, Ajax Compare, Ajax Wishlist: you can add products to cart, wishlist and compare without leaving current page. Quick View: allows you to view product details without leaving current page. Mega Menu: allows you to display a ton of content in menu item including text, images, module and articles. Off Canvas Menu: used primarily with Mobile and touch devices and can provide an extremely useful and beautiful experience for your users. Unlimited Colors: this template is available with 4 color styles: Mandy, Medium turquoise, Celery, and Twine. Besides, it allows you to fully customize color schemes in the back-end. Support JComment: is a powerful and easy to use AJAX based comment system for Joomla. Sticky Header with Mainmenu Improve your website usability using Sticky Header feature. Main menu and logo will always be at the top of the screen, automatically following when user will scroll down. Easily turn the sticky header on or off in template options panel. Support for RTL languages Supports RTL (Right to Left) Language based Designs like Arabic, Farsi & Hebrew. Newsletter Function: AcyMailing is a Joomla component allowing you to maintain real communication with your contacts via e-mail marketing, newsletters, follow-up autoresponders, marketing campaigns, etc. Rich typography: Advanced Typography based on Bootstrap would enable you styling your Tables, Forms, and Buttons along with other elements to make your website more beautiful. Retina Ready You can upload and use a double size of your logo image (JPG, PNG, GIF) to keep looking great on higher resolution devices like retina or 5k display. All iPhone users will be grateful. Logo Option From template settings you can choose logo type, logo position, logo image (also for retina screens) and upload logo used only for mobile devices. Custom Code Use your own custom code, for example: CSS, JS, metatags, links and verification code by using the custom code fields or input more lines of styles inside custom.css file. Akeeba Backup:The best component can be used to backup, restore and move your Joomla! Leonard Shop is fully support this component. It save your time to move development website to live site. Fluid and Boxed Layout Use wide (default) or boxed layout variant. In a second option allows you to use custom background image forwithout editing or adding custom CSS code all settings have easy usage. The images used in the preview are not part of the actual download package due to licensing restrictions.